Learn more about the most important features and how they help you achieve better work results. Projektmanagement-Software umfasst eine große Bandbreite an Softwarelösungen, die Projektplaner, Führungskräfte und Teammitglieder im Projektmanagement unterstützen. Das Spektrum reicht von einfachen Aufgabenlisten bis hin zu umfassenden Projektmanagement-Suiten, die auf die Steuerung großer Projektlandschaften ausgelegt sind. Auch Standard-Bürosoftware kann Projektteams unterstützen - so werden beispielsweise Tabellenkalkulationsprogramme gerne im Projekt-Controlling eingesetzt. Erfahren Sie in diesem Beitrag, wie Projektmanagement-Software definiert wird, wie Sie eine passende Softwarelösung für Ihre Anforderungen finden, was Gesamtlösungen auszeichnet und welche Vorteile eine integrierte Projektsoftware bietet. Project management software helps you track project costs, returns and deadlines — this makes planning and coordination much easier. Organize tasks in free work packages and stay agile with the virtual Kanban-view — this way, team members always know what to do and when. Create new documents and interlink existing ones in the virtual project space — and staying organized becomes effortless. Track real-time capacity utilization in your teams and departments. This way, you can easily optimize the workload distribution. The umbrella-term project management software comprises any software category that is used by executives, project managers and team members to support them in the planning, execution, reporting and documentation of projects. There are solutions in the market, that combine several or even all of the above mentioned features and aspects of project management in one single tool. They are what would be considered full-feature software solutions. How to Find the Project Management Software that is Best for You? There is an abundance of project tools in the market, making the process to find the right software for your needs a little project in itself. Everyone who did only a quick online search might very well have felt a little overwhelmed at the wide range of solutions offered by various providers. With so many options available, how do you pick the one project software that best serves your and your project team's needs? Keep in mind, all throughout the decision making process, whichever tool you pick, it should be evaluated against whether or not it has the potential to help your team collaborate more efficiently. We compiled a step-by-step guide that helps you choosing the solution that best supports you and your team on the way to successful project delivery. Before researching project management tools, you should first define the current situation of project management in your company. Main questions to answer in this context are: How are projects currently being planned and managed? What business processes does project management currently entail and which ones should be improved for better delivery results and increased business productivity? Which aspects of the project management process should in the future be software supported? In order to find out what kind of support your team(s) needs most, it's best to ask those who are currently involved in projects. You should ask the future users of project management software to tell you about current challenges they face and describe cases from their project-based work. You want their backing for this undertaking from the start this will make the following implementation process far easier. Those responsible for selecting a software solution should then define a list of feature requirements based on the survey results. Experience shows that it is not recommendable to let the actual users compile the catalog of requirements — this way companies too often ended up choosing a unnecessarily complex and feature heavy solution. The existing technical infrastructure is a significant aspect when it comes to choosing a new software; especially when it is intended to be used as a company-wide solution. Consult specialists from the IT department to clear questions like: Does our infrastructure and manpower allow for an on-premise project management software? Can we use a cloud-based project management solution? Which systems does our current IT infrastructure support? The status quo analysis of how projects are currently being planned and managed as well as the definition of the IT infrastructure profile are solid grounds for starting a software research. Taking the time to go through steps 1 to 3 actually will help you save time in finding the best project management software for your needs. Based on the requirements catalog, your product search is much more targeted and efficient. When you start browsing for project management software, you are offered a tremendous amount of solutions. Pick three to five tools that fit the previously defined specifications and put them to the test with sample projects. You can use real projects that you've been working on in the past or come up with testing scenarios based on your experience and cases the teams provided to you. The testing process should be supported by live software presentations from the provider — either in person or as a webdemo. Even if you are a well-versed software user, having a solution expert to demonstrate the most important features is of great benefit and helps you accelerate the "get-to-know-the-software"-process. A common mistake made when choosing a project management software is basing the decision solely on the feature range. One of the most important decisive factors regarding the successful implementation of a new software actually is its user-friendliness. Asking employees to get used to a new software at times can be rather challenging, even more so if the software in question is hard to grasp and difficult to use. Resistance against a new system has already frequently led to implementation failure. In fact, the Standish Group's Chaos Manifesto finds that almost 70 percent of all corporate projects to implement project management software fail because of user resistance. While checking a software's user-friendliness you should at the same time assess what the potential implementation costs and training efforts are of the respective software solutions. The duration of the implementation process and the training of all the employees working with the software is an important expense factor. In this case, time really is money and only after implementation and training have been completed can you expect your team to work productively and efficiently with the new system. Steps 5 through 7 help you narrow down your list of potential software options to a maximum of two or three project software solutions. Contact the providers of the software systems that made it onto the short list and request a quote for the software package you need for you project and company size. If none of the initially selected solutions stand the testing process, simply go back to step 4 and do a research re-run with the newly gained insights. Once you picked a project tool, you should focus on gaining and increasing acceptance for the new software among the users. Allow them to gain hands-on experience as soon as possible and help them understand how the software can support and simplify their everyday workload. If you want to implement the new software for an extended project team or company wide, it is advisable to define key users who recieve intensive software training. All the other software users can later refer to the key users if they have further questions on how to use the software in specific scenarios. Every department in your organization has very specific and unique requirements regarding the feature range of a project tool they benefit the most from. The success of production focused departments heavily depends on fixed deadlines and activity dependencies. Marketing departments, on the other hand, often times works with unscheduled task lists that provide information on who currently works on which sub-project at which progress status. IT and development departments are most comfortable working with agile project management methods. Due to the differences in work requirments, departments create their special "island-solutions" that work great for one department but not at all for any of the others. Using different solutions within one company, however, curbs effective cross-company communication and inter-departmental collaboration. Considering the different department requirements, is it even feasible to implement one comprehensive project management software solution for the entire company? It is desirable to have one software solution that everyone works with especially because of the (major) differences among the departments. This helps define company wide standards for project related work across all teams and departments, facilitating easier collaboration and communication between any department or special division. Whether this is possible, heavily depends on the program itself. Ideally, the project software allows working with all the different project management techniques and methods in one single platform. Additionally, it should allow the combined use of different project management methods in one project. This ensures great flexibility for the software users and allows them to choose the method that best fits the project at hands. People often resist project management software tools for a simple reason: they are forced to adjust their way of working to the system, rather than the other way around. InLoox PM project management software allows you to simply continue working with a program that you already use the most every day. The software's seamless Microsoft Outlook integration makes it simple to grasp and easy to use - all you need to be more productive from the get-go. In today's fast paced and competitive business environment with only limited resources, you need to unleash your team's full potential. InLoox PM project management software allows you to empower your teams by enabling participation and alignment in one central platform. Project teams reach excellence because team members always have exactly the project management software features at their fingertips that they require for optimal project execution. InLoox PM offers the best project management software solution across a wide spectrum: The software is full-featured enough to serve as an enterprise-class project portfolio management solution. On the other end of the spectrum, InLoox PM project management software allows team members to quickly report status and easily collaborate. And the exceptionally user friendly interface - featuring one-click quick access to just about any project task and data - makes everyone involved even more efficient. Merging agile and classic project management methods, InLoox PM project management software allows you to work in one central work-platform accross the company. All project related tasks, from developing concepts with the mind mapping tool, managing tasks and creating detailed project planning, document management, reporting and billing, are cleverly interlinked. Even better, our project management software also serves as your dedicated collaboration and communication tool. See how InLoox PM project management software can help you be more productiv and efficient here. Your needs are specific - this is why we engineer project management software solutions that offer exactly what you need. With InLoox PM for Outlook, you get a simple, yet state-of-the-art project management software solution that is designed to adjust to your needs. Check out our solutions for project managers, teams and departments and find out how InLoox project management software can help you pave the way for business success. InLoox project management software solutions are used by high-performance teams in more than 3,000 companies by over 45,000 users in the U.S., North America and all around the world. Our customers are companies of all sizes and from diverse business sectors such as engineering and manufacturing, health care industries, public administration and professional services. Global players like US Airways, Verizon Wireless, AVIS, Siemens, Pentax, and Novartis are just a few of the clients we are honored to serve. Our customers' success is our top priority. This is why we continuously develop our software, inspired by our clients' experiences and feedback to provide them with the best project management software solution for their needs. While InLoox PM for Outlook is really easy to use, we know that with very specific needs come very specific questions. We offer a variety of online project management software resources to give you the answers you need. You can check our InLoox project management software knowledge center to find answers to frequently asked questions, browse our online support center and find instructions in our video tutorial section. If you can't find an answer to your question in our online resources, contact our helpdesk via the InLoox ticket system. 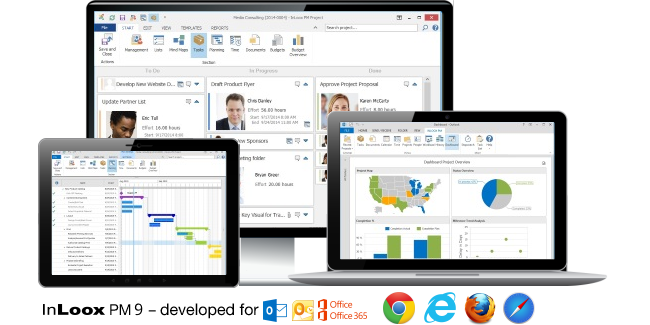 The project management software InLoox PM operates within Microsoft Outlook®, simplifying and combining the organization of projects, documents, resources and budgets. What is Project Software? | InLoox.com • Copyright 1999-2019 © InLoox GmbH. Tous droits réservés.